A Blind Bit of Difference is available in braille, print, online and (soon to be) audio formats! Read all about the wonderful ‘metaphorical wizards’ from Joseph Clarke School, below. This is a sneak preview of the book’s foreword, written by the projects Resident Poet and Sensory Poetry Educator Amy Neilson Smith. From the first moment I arrived with my bags of tomatoes, popping candy, dark chocolate, strawberries, host of smelling bottles and sensory music the students and teachers were excited and keen to eat and experiment with tastes and smells to create metaphors and Spoken Word. Who doesn’t like eating on the job (or in class!!)? Food certainly is the way to people’s hearts, especially students! Of all ages! Some were “gross” by the way! ‘Cruel Capers’ (poem) in this book had a stomach turning effect! Food for me as a Sensory Poetry Educator is the key to unlocking metaphor. Some students who have always had trouble with, or simply never grasped metaphor were brimming with metaphors in our ‘Verbal Tasting Metaphor Games’. The ‘Tasting Circle Game’ in which students keep eating and adding to the last verbalised metaphor, were like a neurological explosion of voices and taste sensations! Metaphorical music to my ears! So exciting to experience! Smells of old fashioned perfume helped one student explore the grief for their Grandmother, feisty music tracks gave rise to another student exploring frustration at ‘ableist’ ignorance, and one of the tastes (spicy in this case!) took them to different countries, with ‘Africa on my Mind’ (poem). The sensory experience is truly magical to watch, as ‘metaphorical wizards’ are born right in front of you! The title, A Blind Bit of Difference, was taken from a student’s poem: Ibraar’s poem. Each and every student was incredible to work with! Their bravery and honesty in their poetry about vision impairment (VI) was and still is astounding. Ibraar’s title was perfect for the book. They are indeed here to make that ‘Difference’! One member of staff was (highly enthused!) but surprised Ibraar was so ‘active’ with his voice and so ‘present’ and dedicated to the project. He hadn’t always been able to find his ‘voice’ or express his experiences of prejudice towards his vision impairment in other lessons. This is crucial in our current ‘system’ in the UK. Benefits cuts and the removal of their services, access and support need fighting. Young people and students are the future! They need to be heard, celebrated and published! It is exactly for this reason that Poet Residencies are essential in schools, to open a ‘metaphorical gateway’, a new chance to find their voices! Open up their worlds! Some students were so well read in young people’s literature and audio books I had to do homework! I feel educators and teachers always learn from their students. Positive facilitation allows children to be their own teachers. Independent learning leads to independent children. Independence and an ability to rely upon your own light to guide you is an essential key to being powerful and successful even at times of great challenge. Whilst we as educators are indeed the pumping heart, fuelling the body of the lesson, it’s well hidden under all its powerful muscles...the students! They feel your supporting drive but learn to move at their own pace, independently! We discovered what the trick was! Once discovering the ‘sensory metaphor’…we had to disguise it! In this book they are often hidden under the poem’s skin. Don’t expect your weekly food shop to fall out on the page, like the classy poets these amazing ‘metaphorical wizards’ are, they are woven with great subtlety into the sensory landscape. The book has received fantastic reviews from famous writers such as THE Michael Rosen and fantastic national disability arts charities such as ‘Sense’! 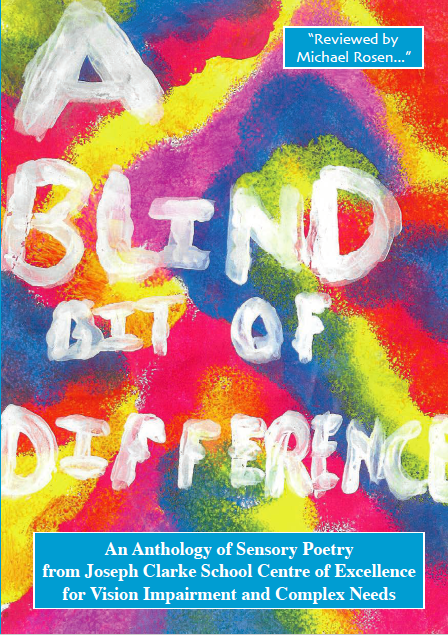 After the successful publication of the brilliant A Blind Bit of Difference, Amy Neilson Smith will continue to work with her “metaphorical wizards” at Joseph Clarke School to produce an Audio Book of their wonderful work! Listen to some sneak previews below and follow our social media to find out when the audio version of A Blind Bit of Difference becomes available! Hurray! It’s Joseph Clarke School’s Centenary Year! They are 100 years old this year! This book and its wonderful collection of the students’ sensory poems was part of the recent royal celebrations! Read this exciting blog to find out all about it! Whitefield Schools is an outstanding school with an international reputation in special education expertise, curriculum and resources that is reflected in its National Teaching School status. Joseph Clarke School is highly regarded for its expertise in vision impairment teaching. It attracts pupils from across London and surrounding counties with vision impairment and/or complex needs. Together with their Research and Development Centre they provide support, training and resources for other educational settings looking to improve the way they cater for their students with special needs and who have vision impairment. The Trust is also working to support children and young people to find their place in the wider community and to help members of the wider community to develop a better understanding of people with SEN.